I was trying to get this item shortly after the zone went live. Tried for over a year from then with zero luck. So I came back to have another go today and low and behold. First pull of Witherins and I get two. Killed the first one than finally killed the second. Looted the second and it was empty. Looted the first one and there was the starfish. Had to run my monk in Shroud form because they didn't have a Lev potion or device. and looted their new starfish. I forget exactly which one it was, but I found one these on one of the basilisks 2 nights ago. I had killed primarily the witherans in the past, and this time was going through the entire zone killing pretty much every mob type (to keep from getting too bored) except the basilisks. Finally decided to kill a few, and the 3rd one dropped the Starfish. I was inspired by a guildy camping a Dusty Soriz Pouch so I headed down here to get a starfish. Originally I tried for Dreadspire, but my group did not survive the trip there and called it off. Spent a bit over an hour, maybe longer than that in here just moving down the ramps killing squiddies and orcs with just me (72 Rogue), tank merc, and my boxed 65 cleric. Dropped from an orc near the non-KOS task giver guys. Decided to go to SRF with my monk 72 for camp item. Dropped at second mob !!! is more easily obtained (at least from a drop rate perspective. I zoned into Stoneroot this afternoon with my 72 Bard and 72 Druid. Right at the zone in there were 2 mobs, a Xillsfar Soldier and a Twinblade. This little item dropped off the soldier. I didn't even know about the item beforehand. When I saw it, I was flabberghasted. I had been making fishbone darts for my bard for a while now. Now I won't have to. Can I just say, WOOT! 6,343,956 mobs, all different races.. lots of runes and swords, no Starfish. 4 days and 197 AA so far. At the rate this drops I am going to be 68 before I even get a sniff at this item. My poor monk will just have to survive without it I guess. On a side note. 35 hours killing Shills, Witherins and Drachnids and still no drop. But 10 levels. Dropped off a Deep Orc today, was farming Captain Klegor and had it drop from one of the two packs of three Deep Orcs. Seen this drop 3 times in the last 4 months, it seems to have about the same drop rate as Skymaul, and is totally random. After it dropped once in 3.5 months, I've seen it drop twice in the last 2 weeks! In fact, if you were to ask me, I would say that the aug "Inset Razortooth Coral" is a rarer drop than this. I didn't even know it existed until yesterday, 1st time I've seen that aug and I've been in SrF daily for 4 months grinding AAs while its a hotzone. I'm talking hundreds of hours easily. As far as what mobs I've seen the Stoneroot Starfish on, a witheran, a drachnid, and a drachnid deceiver. But like I said, its totally random so it will drop of any mob in SrF. I camped/hunted in Stoneroot Falls for 34 hours total in a span of 3 and a half days and it dropped for me from witherans . Dropped off of an assassin. 2nd day of farming, got another one off of Xillsfar Twinblade Adept. 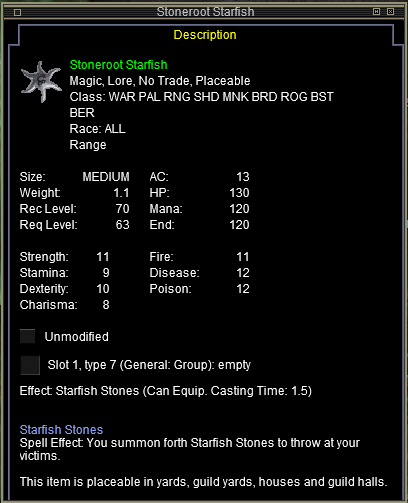 2nd day of farming, got a 2nd stoneroot starfish off a Xillsfar Prelate. :( I have been hunting this on and off for years. That is including 8 evenings this past month with no luck yet. Judging from the drop frequency data collected by Magelo, it looks like this can drop from lots of different mobs -- including several not yet listed above, but still mostly witherans, orcs, shadowmanes, drachnids, and drained shiliskins of various types -- but always with a very low chance. Overall, the stats there currently include roughly 19000-20000 mobs looted, and 17 starfish dropped. It dropped off a witheran between Meldrek and the ramp that goes into the water. Wasn't looking for it but was a nice surprise. By the way, it dropped today Dec. 11, 2007. Got one this morning - Aug 30, 2007. Root-rotting with a shaman by the Dreadspire totem/zone in. Dropped off of a Shadowmane Pathwalker, 4th Shadowmane killed. Was very psyched for my rogue. Anyone know if this still drops? I've been killing Witherans for what feels like weeks (because it has been). It's been 3 weeks as of tonight over here on Luclin server... no drop yet. I am certain it still drops, but tis extremely rare apparently. OMG I have been camping witherans for this starfish, for over two weeks now, closer to three. Was about done for the evening tonight and pulled two more witheran feeders, they each dropped a starfish, I could not believe it. My rogue and my beastlord were both very very happy campers. A drained shiliskin soldier dropped it as well today. Can you equip starfish and still throw stones? Can you keep the starfish equiped in the range slot and put the stones in the ammo slot and still thro the stones, or do you need to equip the stones in both slots to throw them?